If Assange leaves the Ecuadorean Embassy then he is likely to be arrested for breaking his bail conditions. This would provide the UK Government with two options: first they postpone the surrender of Assange to the Swedish authorities until he is prosecuted for breach of bail; or alternatively they surrender him but enter an agreement with the Swedish authorities that once proceedings are complete (which would include the serving of any sentence) Assange will be returned to the UK for trial. This is permitted under Article 24(2) of the European Council Framework Decision on European Arrest Warrants. The UK could then give assurances that it would refuse consent to any application to remove Assange from Sweden as that would breach the agreement and the UK’s consent is required under Article 28 (4). 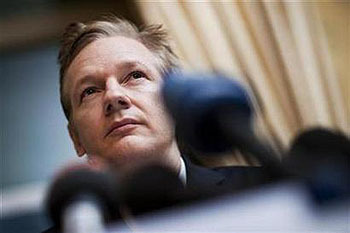 If the UK Government is to believed, it is only extraditing Assange as it has a legal obligation to; if the Swedish Government is believed it wants to investigate the allegations that have been made; and if Assange is to be believed he is prepared to go back, but doesn’t want a bag over his head and to be wearing an orange jumpsuit whilst tied to a gurney. The assault charges against Assange have always been hard to get a handle on. On the one hand, you can’t ignore them. They have to be investigated. On the other hand, the timing has always seemed weirdly convenient. After an entire lifetime of apparently not sexually assaulting women, suddenly there were two separate charges coming right at the time that WikiLeaks began releasing confidential U.S. cables and videos. But regardless of what you think of that, Assange’s fear of being extradited to the U.S. seems pretty reasonable. What’s more, I have little doubt that if the UK and Sweden really wanted to, they could figure out a way of giving Assange the assurance against extradition that he wants. I’ll bet they’d do it if it were someone worried about being extradited to China. I can’t pretend to know everything that’s going on here, but still, common sense suggests that the fact that both the UK and Sweden are stonewalling is telling.